This highly unrealistic reassurance prefacing Brighton Rock was the inspiration for the comedy series Inspector Steine – the first series of which was broadcast in spring 2007. I wanted to write about a celebrity police inspector in the 1950s who innocently (and touchingly) believed precisely what he had been told at the movies; who loved Brighton for the ice cream, the humbugs and the fresh air, and just laughed at the idea of chaps called Kemp Town Charlie or Fiveways George. Alongside him would be his long-suffering sergeant, a sensitive and earnest man overwhelmed by evidence of criminal wrong-doing, but powerless to fight all the villains on his own. And as the idea for the series evolved further, along came a keen (and very clever) young constable, and the inevitable cockney charlady. The four of them would work together, I decided: the chap in charge who refuses to accept that there is any crime in Brighton; the depressed but dogged sergeant (“Permission to go undercover, sir?”); the constable with his laser-like intelligence, who thinks they should concentrate on identifying Brighton’s criminal mastermind; and finally, the cliché cockney charlady who just happens to be – well, Brighton’s criminal mastermind, operating completely undetected in their midst. It’s possible that I had too much fun with the names. Steine (pronounced “Steen”) refers to a Brighton landmark – the Old Steine being a large, flat, historic public garden area leading up from the Palace Pier. Sergeant Brunswick is named after a fashionable quarter of Hove. Meanwhile “Twitten” – the name of the constable – is the quaint Sussex word for alleyway; and somehow I couldn’t resist calling the charlady/mastermind Mrs Groynes. The new, third series, still set specifically in 1957, reprises some characters from the first two series (the very scary Ventriloquist Vince, the very evil Mrs Vine, the very disgusting Stage Door Albert, and the very troublesome holiday-makers from Tottenham, Roy and Doris), but also takes us to some new settings, such as the Black Rock swimming pool, the cricket ground in Hove, and out to sea in a boat. New characters are played by Philip Jackson, Adrian Bower and Douglas Hodge. Each episode has a title from the work of the famous Brighton-resident playwright Terence Rattigan. As in the previous two series, there is little attempt to recreate the real crime scene of Brighton in the 1950s. Steine is happiest when eating ice cream; Brunswick is happiest when receiving flesh wounds while pointlessly undercover; Twitten is happiest when knowing more about everything than anyone else; and Mrs Groynes just runs rings round everyone and gets away with murder. 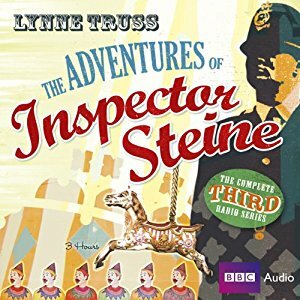 As before, The Adventures of Inspector Steine is written by Lynne Truss and produced by Karen Rose. It is a Sweet Talk Production for BBC Radio 4. Music is by Anthony May. Studio production, David Thomas. Twitten returns from a stint at Scotland Yard with big ideas about creating criminal records – and big news, too. The great Harry Jupiter of the Daily Clarion wants to write an article about Sergeant Brunswick. Will Brunswick be cheered up at last? Or will Steine somehow or other contrive to ruin his life? “I’ll need a Remington in good repair, some foolscap paper with new carbons, a large ashtray, an up-to-date street map of Brighton, three fig rolls, a green visor, some functional sleeve garters and a place to hang my mac where I can see it,” says Jupiter on the phone. “Are you a journalist?” Steine asks. With Philip Jackson as Jupiter and the versatile David Holt as a series of useless underworld informers, including Barrow Boy Cecil. Brunswick has vowed to kill Inspector Steine. He is very, very angry. “I’ll kill him,” he says, repeatedly. Meanwhile Twitten is determined to create criminal records for Brighton. An unknown villain with a Northern accent is seen in Luigi’s. How can the brilliant Mrs Groynes turn all these factors to her advantage? Can she thwart Twitten by exploiting Brunswick, and at the same time pull the wool over the eyes of Steine? Of course she can. It’s a doddle. With Adrian Bower as the Unknown Villain and Ewan Bailey as Ventriloquist Vince. Brunswick is deep undercover with the Unknown Villain, and can’t understand a word he says. “Have you ever done a tray on the cave grinder?” the Unknown Villain rasps, and Brunswick can only moan a bit and say that he probably hasn’t, no. When Twitten and Mrs Groynes realise how dangerous the Unknown Villain is, they foolishly refuse to listen to Steine’s elaborate plans for a road safety day. Are things as black and white as they seem? Unfortunately, they are, yes. With Adrian Bower as the Unknown Villain and David Holt as Stage Door Albert. It is the day of the annual Villains v Police cricket match at Hove. There have been several attempts on Steine’s life, and he has reacted to all of them by screaming and hiding. But if it isn’t Brunswick behind the falling masonry, the electrified door-handle and the flaming arrows in the cricket pavilion, who is it? It’s surely not … the evil Mrs Vine, who has already broken the hearts of Steine and Brunswick? How will she enslave Twitten? What is she up to? And how can Sergeant Brunswick’s brilliance at the bat be turned to criminal advantage by the brilliant Mrs Groynes? With Janet Ellis as Mrs Vine. Oh dear. Four characters adrift in an open boat. And here comes another big wave. “Sit down, sir! Sit down!” How did they get here? Whose purpose does it serve? Will there be a turf war in the next series? Assuming they get back to dry land, there absolutely will…..